The concept of alkalinity, or in your pool’s case, total alkalinity, might be a little obscure. Pool water pH is a little more intuitive to understand, and calcium hardness is easier because this relates to having hard water or soft water. Total alkalinity is the measurement of the buffering ability of the water. Water with a balanced total alkalinity level can resist, or act as a buffer, against steep and sudden changes in pH. In this article, I explain all the ins-and-outs to testing pool alkalinity in your swimming pool. If you want some background on total alkalinity, read my overview article: Maintaining Swimming Pool Alkalinity. 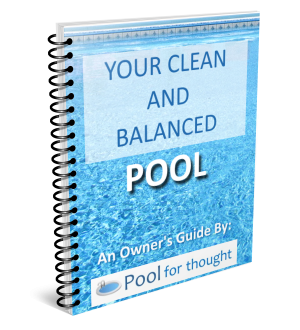 You can also read my other two articles if you test your total alkalinity and need to raise or lower it: Raising Pool Total Alkalinity and Lowering Pool Total Alkalinity. Why test your swimming pool total alkalinity? 1 Why test your swimming pool total alkalinity? Total alkalinity should be tested first, before testing pH and calcium hardness. The reason is total alkalinity is a strong driver of the pH, so if you first balance total alkalinity, the pH will fluctuate less and you will have an easier and more accurate time testing and balancing the pH. Adjusting alkalinity and pH can also affect the calcium hardness, and is why this is recommended to be tested last. The only exception to this rule is if the pH is very low (far under 7.0). If this is the case, first raise the water pH to 7 first, and let the water sit for 24 hours, then test total alkalinity. Even if pH and calcium hardness are balanced, the pool water is still out of balance if the pool water total alkalinity is low. Too low, and the water can be corrosive. To high, and the water can turn cloudy and eventually deposit water scale. Low alkalinity can bring down the pH. Low pH is a common reason for the corrosion of metals, staining of pool walls, plus irritated eyes, nasal passages, and dry skin exposed to the water are common in swimmers. The water needs to have some buffering ability, but not too much. Over buffered water can result in scaling, which can plug pool equipment, pipes, filters, and result in a cloudy pool. If you do all your own testing, then you realize testing for pH, calcium hardness, and total alkalinity are very similar. If you use test strips, the similarity is obvious – put strip in water, remove, and compare the colors. When using a test kit, the process of taking a water sample and adding reagents and reaction chemicals is also similar. Total alkalinity test strips are an easy way to test. Test strips are commonly used to test total alkalinity. Many test strips also test for pH and a sanitizer like chlorine or bromine, as well as total alkalinity. The following quick instructions are general guidelines on using test strips to test alkalinity. Always follow the test strip maker’s instructions. Get the pool and yourself ready. Open your pool at least partially if it is covered. Make sure your hands are clean and dry, to avoid contaminating the test strip and potentially all the strips in your container. Handle the test strip with care.Take out one test strip, then immediately recap the bottle. Be careful not to touch the strip to anything or drop the strip on the ground. Again, you don’t want to contaminate all your strips. Dip the strip.Dip the test strip into a well-circulated area of the pool down to your elbow, for about one second. Let the strip sit.Hold the strip horizontally with your hand or lay the test strip down for 15 seconds, making sure the strip is not in the sunlight. Compare colors to determine level.Compare the total alkalinity color pad on the strip with the color code on the test strip container. Make a note of how high or how low you are. Low total alkalinity? If you are under the ideal range low limit (80 ppm), then you need to raise your pool total alkalinity by adding sodium bicarbonate (baking soda). High total alkalinity?If you are over the ideal range high limit (100 ppm), then you need to lower your pool total alkalinity by adding muriatic acid or dry acid (sodium bisulfate). Dedicated total alkalinity test kits are available, but we recommend getting a complete test kit. More accurate method is by titration using a test kit. To do this, you add a combination of two indicator reagents together, then count the drops of a follow-up reagent. Clean the comparator tube. Rinse the test kit comparator tube to make sure it contains no residue from a previous test. Get a water sample.Dip the entire comparator tube to a water depth of about your elbow. This ensures you are sampling water that is not altered by the air and sunlight. Adjust water in the tube.You only need 25 mL of water in the tube, which you can remove portions of excess water easily by “flicking” the comparator tube. Add the first reagent.Add 2 drops of Sodium Thiosulfate (Taylor R-0007), and swirl the tube to mix. Add the second reagent.Add 5 drops of the total alkalinity indicator reagent (Taylor R-0008). Swirl the tube to mix everything together. Watch for a color change.The tube mixture should turn green as the two reagents have now mixed. Add the third reagent.Add the sulfuric acid reagent (Taylor R-0009), one drop at a time into the tube, counting each drop and swirling the mixture after each drop. Watch for a color change.When the tube turns from green to red, stop adding drops. Determine the total alkalinity level.Multiply the sulfuric acid drops you added by 10. This is the parts-per-million (ppm) total alkalinity of your water. Low total alkalinity?If you are below the total alkalinity low limit (80 ppm), then you need to raise your pool total alkalinity. Adding sodium bicarbonate (baking soda) will accomplish this. High total alkalinity?If you are above the high limit (100 ppm), then you need to lower your pool total alkalinity by adding muriatic acid or dry acid (sodium bisulfate). Digital testers like this can test multiple water balance levels. Several manufacture make digital alkalinity meters, but they involve the use of chemicals (reagents), much like a test kit. The test method is determined entirely upon the individual electronic test device, so you need to follow their directions. High chlorine can interfere with total alkalinity test results. When testing the color change, one of the colors can become bleached out, causing invalid test results. A chlorine neutralizer needs to be added during testing to clear the water sample of chlorine. Add more neutralizer if the test results are off until you get the expected colors. Test after filling or refilling pool with water, after it has rained, flood waters, or runoff have entered the pool. Total alkalinity is called such because it is the sum of all forms of alkalinity, including carbonate alkalinity and cyanurate alkalinity. Since we are mainly looking for the carbonate alkalinity, some pool product and test providers recommend adjusting the test results and essentially factor out the cyanurate alkalinity. Testing total alkalinity is vital to knowing the health of your swimming pool water. As keeping your water balanced is a key to maintaining a swimming pool, testing and knowing the total alkalinity of your pool water is part of this knowledge.